Whitby, an enchanting town on the North Yorkshire coast of England. Magnificent cliffs, a quaint harbour & the ancient ruined abbey. These days Whitby roles itself as a cosy fishing port with extensive sandy beaches making it a popular tourist destination yet that wasn't always the case. Whitby's past is rich, diverse and actually shaped the whole of Europe. Whitby offers the visitor a chance to stroll around the exquisite town. A mix of alternative shops, fishermens cottages, Georgian town houses (renovated into good quality public houses), cobbled streets and the never ending cry of seagulls leaves us with everlasting impressions. Whitby also has its mysterious side and was the inspiration for the novel Bram Stokers' Dracula and Whitby is the place for many pivotal scenes in the book. Its a town steeped in folklore and myths. Whitby was originally called Sinus Fari by the Brigantes who were a Celtic tribe controlling large sections of Northern England 2000 years ago. By 71AD they had been conquered by the Romans. In 657AD Whitby became known as Streonshalh, when the Christian King of Northumbria, Oswy founded a monastery and abbey there. It was a very significant double monastery of monks and nuns which was actually run in the Celtic Tradition. There was a major event in the abbeys history in 664AD, `The Synod of Whitby´. The most eminent clergymen of the Christian Church were summoned to settle the dispute over which tradition, Ionan (Celtic) or Roman would be followed and how they should calculate the date of Easter. The result was in favour of the Roman ways for the whole of Europe!. Everything from that day changed in Europe: the calendar, politics, the type of dress right down to getting rid of the celtic/pagan/druid long hair, and introducing shaving of the head. Unfortunately from that day on things became more rigid, more controlled, more economic. 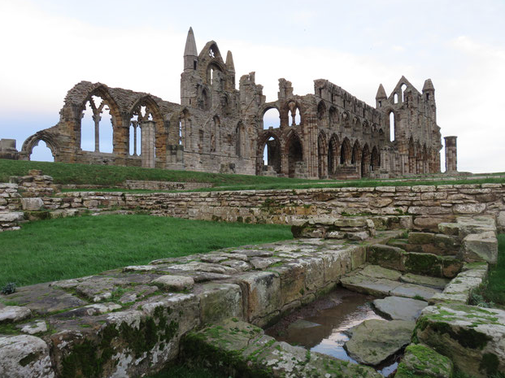 At the same time as the Whitby Synod, the abbey was also home to the great Saxon poet and father of English sacred song Caedmon, whose 7th century poem... The Song of Creation is the earliest known poem in English. The beautifully carved Caedmon cross stands at the top of the 199 steps Leading up to the clifftop abbey from the bay. In 867AD Whitby fell. Viking's attacked! the Saxon Monastery was abandoned and destroyed. When the Normans arrived in 1078AD the benedictine monastery was re-founded under orders from William de Percy. Then in 1539 the monastery was dissolved and destroyed following the second suppression Act of Henry VIII. Whitby abbey was further damaged in 1914 when the west front was hit by shells from a German warship. Whitby and its surrounding area North Yorkshire is steeped in Folklore, Faerie Lore and Local Legends. On the surface it doesn't seem so, but beneath the ice cream and fish & chips, dwells some intriguing stories from an area which has a very special power, character and eccentric charm. St Hilda the Abbess of Whitby has a couple of legends associated with her. One legend says birds especially sea birds would not fly over the Abbey for fear of soiling it when St Hilda residing there, and it was also claimed that those birds that flew past it always dipped their wings in flight "thus to do lowly obeisance to its hallowed precincts","They told how sea-fowls pinions fail as over Whitbys towers they sail and sinking down with fluttering faint, they do homage to the Saint". Faerie Lore is one with the surrounding landscape and words such as bogart, hob, boggle can be found in local villages. The name 'Hob' has been noted as an overall term given to a goblin, boggle or brownie. Hobs are often described as short, hairy, ugly and bad tempered. Despite some claims that they have also been known to heal and help the Bogart is commonly characterised by malevolence and causes mischief by souring milk, turning stock lame and hiding folks belongings. If one is unlucky enough to find or feel your house inhabited by a troublesome Hob. Running away or moving house also doesn't seem to help matters as this otherworldly being simply follows!. The old ways also said that the worst thing one can do is to give the bogart a name as once this had been done there will be no reasoning with him. Whilst commonly a house hold creature quite a few of Whitby's local beauty spots have links with Hobs and Bogarts which can be seen reflected in their names; Boggle Hole and Hob Hole being the most obvious. Boggle Hole sits between Whitby and its coastal neighbour Robin Hoods Bay. In local folklore Boggles were believed to be little people that inhabited many of the caves running along the coast. It is also thought that these caves were often used by local smugglers as a place to unload and hide their smuggled goods. Hob hole sits near the fishing village Runswick Bay, some miles North of Whitby and is said to be inhabited by a Hob with an uncommon gift. The local fishermen and their families are said to have believed that the resident Boggle living in the cave could cure whooping cough. No fisherman would ever dare to step into the entrance to this cave or any other of these strange coastline caves at night in case a boggle or other spirit attached itself to the fisherman and ended up coming home secretly coming home with unfortunate fisherman. The wives of the fishermen had more courage especially in times of need by carrying their sick children down into the caves and calling upon the Hobs mystical healing power. Tucked neatly into the North East coast of England, Whitby makes a interesting, joyful destination, whether it be a stroll along the beach, fossil hunting by the cliffs, or a never forget experience up to Whitby Abbey. The surrounding area is also packed with quaint villages, little hidden coves, empty beaches and friendly, open hearted locals.